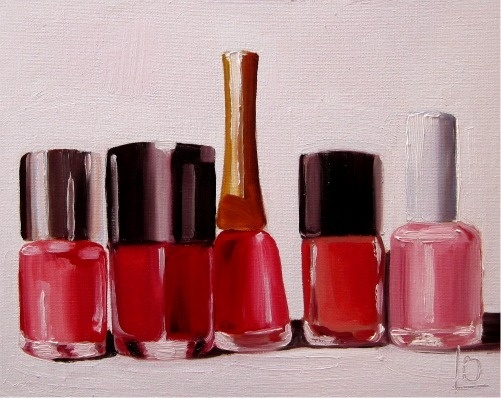 A small original oil painting of five red nail varnish colours, painted on a canvas panel. The painting has various shades of red- all classics in their own right. Although I sell this painting framed in the studio- I worry about sending glass through the mail- so I offer it unframed online. If you prefer to keep it unframed, the you can prop it on a shelf or dressing table without any problems. Alternatively, I'm happy to advise you of the best way to frame it. This painting is also the perfect size to send to all you lovely people that live in far away lands.